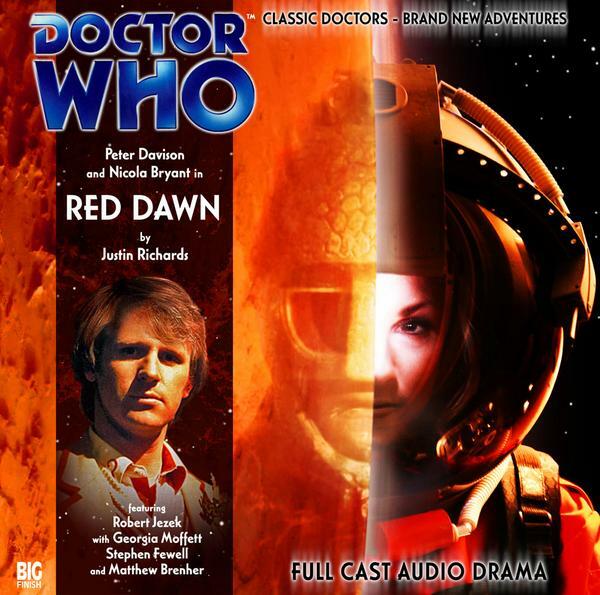 Peter Davison as the Doctor in…Red Dawn. The Big Finish audios carried the proverbial torch during the time between the Doctor Who TV movie and Nine’s debut in Rose. Coming into the audios, there was a lot to prove for some of the participants. Colin Baker was the only actor to be fired from the role, Sylvester McCoy had the showed canceled during his tenure, and Bonnie Langford wasn’t the most popular of companions. The work they’ve done during their time with Big Finish has gone a long way towards showing a new side to these characters, with Colin Baker even being voted “Best Audio Doctor” by the fans. Peter Davison, on the other hand, had a successful run that he left from during its height, following the advice of Patrick Troughton. His return to the role of the Fifth Doctor has seen him pick up right where he left off – the kind, curious peacemaker. His run of serials up to this point, which consists of The Sirens of Time, Phantasmagoria, and The Land of the Dead have been solid pieces with the thrills, action, scares, and dialogue that one would expect from the Fifth Doctor, but as a whole, they’ve really been nothing to write home about. Red Dawn continues that pattern, a simple, solid, well-constructed program that will satisfy the listener, but not stick with them for very long after the finale. The serial before this one, which I will review as part of a four-story arc in a few weeks, reintroduced a long time enemy to the Big Finish line. 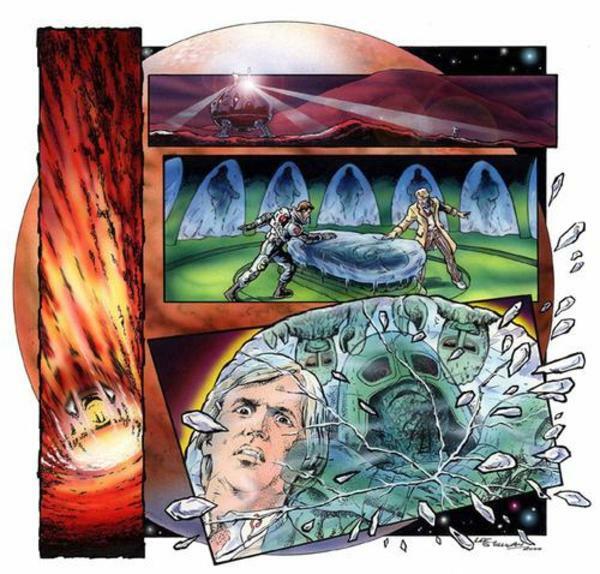 This story reintroduces another enemy – the Ice Warriors, last seen during the Third Doctor serial The Monster of Peladon and seen recently in the Eleventh Doctor episode Cold War. For those who are being introduced to the Ice Warriors for the first time, their portrayal is a bit on the nose and heavy-handed. The Ice Warriors from Pertwee’s time were noble, proud, and honor loving, and those facts are often repeated during the serial. While it allows them to debate ethics and their actions with the Doctor, the dialogue tends to drift into “ok, ok, we GET IT” territory at times, which is a disservice to the actors who have taken the parts of the main Ice Warriors. Matthew Brenher as Lord Zzarl speaks with a low, rasping tone that immediately stands out from the menacing whispers of his rank-and-file, specifically Sstast as played by Hylton Collins, Zzarl’s adjutant who comes off as smart, intelligent, loyal and tough when needed. The voice alteration is superb for the Ice Warriors, establishing them as an alien race without being harsh on the ears. The astronauts, however, don’t have the same luck. One is killed off early, another does little but stand around and provide exposition/ask questions so the Doctor can answer them, another is revealed to be the “true” villain but “cool and collected” comes off as “bored” and “under pressure” comes off as “panicky,” and the fourth has a secret that is revealed in an almost “oh, yeah, let’s throw it in” manner that, while it makes sense, comes off as just a bit unbelievable. Georgia Moffett, who plays Tanya, is the only human who stands out from the crowd; understandable, in a way, since she’s Peter Davison’s daughter and acting along side of her dad! This is, as “canocially” as Big Finish is allowed to get, Peri’s first adventure with the Doctor, taking place immediately after Planet of Fire. The script by Justin Richards gives Peri a lot to do, keeping her seperate from the Doctor for a good bit of the serial’s running time. She comes off as brave and smart when confronted with several problems, even using her character’s background as a botanist, and has a very good joke to keep an ear out for. Peter Davison is the Doctor, the one who realizes, just a bit too late, what’s wrong, and tries his best to keep the peace even as everyone dies around him, keeping his portrayal just as it was when he was on television. He wants an end to conflict, but the situation keeps escalating around him no matter what he does. You can hear the desperation in his voice as the serial goes along as things spiral out of control. The serial, sadly, suffers from several problems, mainly with the script. Along with some cringe-worthy dialogue (“you won’t win – people like you never do!”), the return of the Ice Warriors and Five/Peri’s first time together could have been amazing, but the true villain of the piece comes off as boring and hapless. There were a few times the Ice Warriors could have killed him, only for the Doctor to talk everyone down from the ledge, only for the same thing to happen again down the road. The big “secret,” when its revealed, comes off like the villain is reading the laundry list. The music also doesn’t hold up, which really drags down an audio-only performance, even as the sounds of melting, cracking ice, the winds of the Martians plains, and the sounds of the Ice Warriors’ sonic weapons are top-notch. It’s a bummer. I really wanted to like this serial, as it’s MUCH better than The Waters of Mars and is a both a great exploration story and a good re-introduction to the Ice Warriors. The villain and the script, though, drag it down just a bit too far, which is a real shame. Five, Peri, and the Ice Warriors, thankfully, do well by Big Finish down the road. Next up – In a desolate Cornish landscape littered with relics of prehistoric man, the doctor and Evelyn uncover a catalogue of mysteries. Colin Baker as the Doctor in The Spectre of Lanyon Moor. This entry was posted in Big Finish Review and tagged Big Finish, Fifth Doctor, Ice Warriors, Peri Brown, Peter Davison, TARDIS. Bookmark the permalink. I actually quite enjoyed this one and would have rated it higher I can see your points, but they didn’t have quite the same negative impact for me. For instance, I liked the lead up to the twist and just wish the reveal had been a bit more dramatic. Well-composed review, despite the differing opinion. I chalk it up to wasted opportunity, and the disappointment of a sub-par Ice Warriors drama (especially having recently watched Cold War) meant I may have been a bit harsher on it than I should. Hmm…in a few years, I guess I’ll have to re-review it!